It’s that time of the year again – rumours about Apple Inc.’s next spearhead are getting hot, and rival Samsung has already sent out invites for the launch of its new smartphone. Samsung has officially sent out invitations to its annual Unpacked event on March 1 in Barcelona, leading into Mobile World Congress (MWC). Following Apple’s footsteps, Samsung tries to keep a tight lid on what exactly it’s going to unpack, but most analysts agree that it will be the Samsung Galaxy S6. Reading into the look of the invite, it’s going to be a curved smartphone, a la the Note Edge. 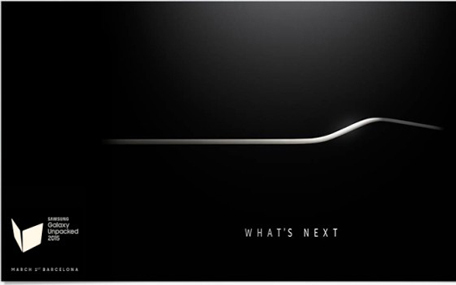 Ergo, the Galaxy S6 will be a curved smartphone with a side panel display. How different will it be from the current Note Edge? We’ll know in 26 days, but for Samsung’s sake, we hope that they do have a rabbit in the hat. For, it will take some superior magic from the South Korean major to beat the benchmark set by the iPhone 6 and the iPhone 6 Plus. Samsung, as we have noted in the past, is getting a wee bit desperate to retain its title of the leading smartphones retailer even as it had to share the title in the most recent quarter with it arch-rival. With Apple unveiling its spearhead smartphones once a year, usually in September, Samsung tries to give it a six-month window before launching its own spearhead – and also to gain a six-month headstart on Apple’s forthcoming launch. This year seems to be no different, with Samsung expected to unveil the Galaxy S6 on March 1 while Apple is expected to stick to its September launch for the iPhone 7, or the iPhone 6s and iPhone 6c as many are reckoning. Last year wasn’t Samsung’s favourite year – it’s Galaxy S5 smartphone failed to deliver the goods its fans were expecting, and rivals stole a march over it in almost every segment of the smartphones market. Apple of course stole its lunch in the high-end bracket, even as Huawei and Lenovo did so in the mid-tier, and Xiaomi and other Chinese brands attacked it at entry-level. Understandably therefore, Samsung has been talking big about how the Galaxy S6 will be a major departure from the Galaxy S5 in terms of design. It better be – or Samsung seriously risks losing its leadership slot that it has so painfully guarded since Q4 2011. For that, it will really have to pull a rabbit of the hat with the Galaxy S6 – customers are already expecting an edge design, and Samsung seems to have confirmed that with its Unpacked invites. Will that be enough to pull crowds back? Unlikely. But with some other features – most notably a metallic unibody chassis, a dual curved design (as opposed to Note Edge’s single-side display), and simpler software – it may just get back in the reckoning.